Reset Protection is a new service that prevents an unauthorized user from resetting the phone with a new Microsoft account. 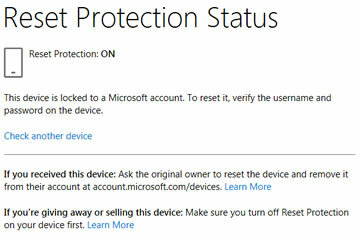 If a user must reset a protected device, they are required to sign in to the Microsoft account and turn off Reset Protection prior to resetting the device. 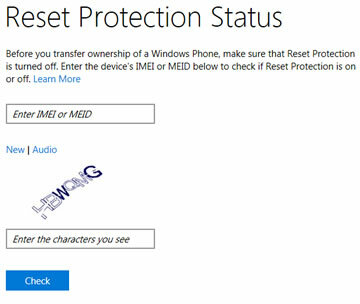 Prior to selling or giving a protected device away, it is important to turn off the Reset Protection feature. To verify if a protectable device is still protected or not, launch a web browser then navigate to: account.microsoft.com/resetprotection. Enter the IMEI or MEID (include any special characters) then click Check.